Hello blogger friends. I am Natalie from Designer Bags and Dirty Diapers. I am so honored to be guest posting on Lindsay's blog today. She is one of my all time favorite daily reads. Always inspiring me with her fabulous interiors and hilarious wit. Oddly enough we both emailed each other to do guest posts this week because we are both on vacation- great minds think alike right? Hopefully we are both busy consuming way too many beverages and tasty eats as you read this. I think I may quite possibly be the only person who gains weight in the summer. So in order to shed a few pounds before we head on our beach vacay, I have been eating super healthy. This salad is something I just kind of created with veggies I had on hand and it is incredible. So light nd refreshing! I hope you will enjoy it as much as I do! Shave the raw Zucchini with a vegetable peeler to create thin ribbon like strips. Slice the Cherry Tomatoes in half and toss with olive oil. Roast at 400 degrees for about 20-25 mins. Cook Butter beans according to package. I buy fresh butter beans and cook them in salted water about 30 mins until they are soft but you could totally use frozen or canned beans as well. 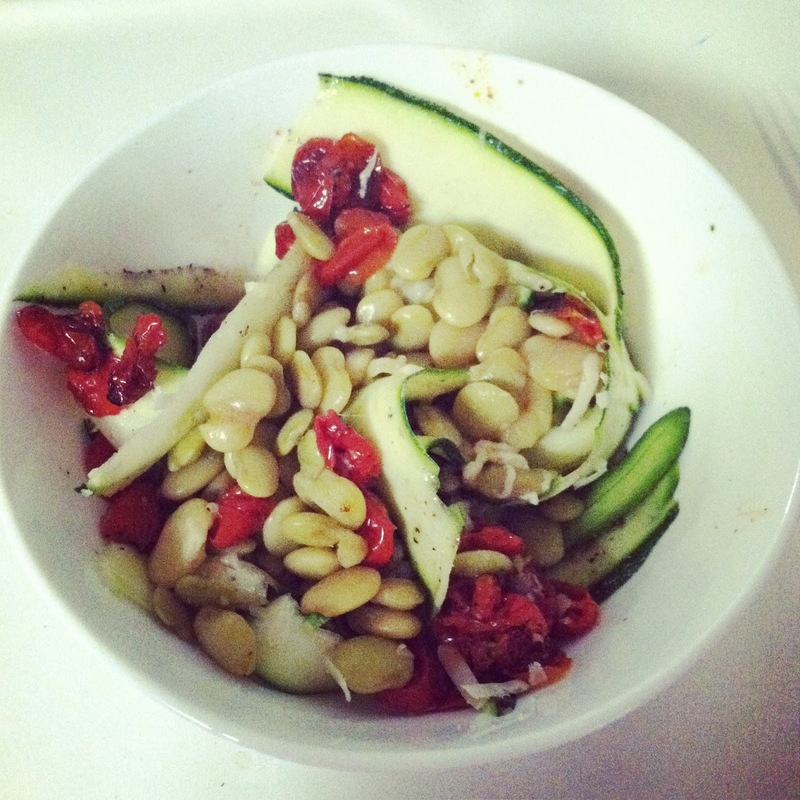 Toss together the shaved Zucchini, Roasted Tomatoes and Butter Beans. Drizzle with olive oil, lemon juice and salt and pepper. Top with fresh Parmesan or feta cheese. Love you both! This salad looks yum! Will def. try this recipe! Two great blogs! This looks like something I would try. Thanks! Yum! This salad looks awesome! Can't wait to try it! love Lindsey's blog too! Also love yours and your name!